These exfoliating vials are a powerful treatment for home use, designed to combat dull, uneven-toned, dry and fatigued skin and restore its vitality and natural luminosity. *EVIC study, instrumental evaluation. (EVIC is the largest Romanian private center for research, experimentation and evaluation of cosmetic products, biocide and medical devices). The AHA complex offers a gentle exfoliation, polishes away built-up layers of dead skin, enhances hydration, smooths the appearance of wrinkles, restores and revitalizes complexion, leaving it brighter, smoother and polished in appearance. Stable form Vitamin C, with high anti-inflammatory and anti-oxidant effect properties, significantly improves the general appearance of the skin: stimulates the synthesis of collagen diminishing lines and wrinkles, restores the natural protective barrier of the skin. For an effective depigmentation regimen use in association with the Whitening Gel. Usage: Apply once a week. Get the serum entirely at the bottom of the ampule. Break the serum ampoule using a tissue paper or textile towel. Make sure you hold the ampoule standing before breaking it, to avoid spilling the product. Pour the content into the palm of your hand and apply it on your freshly cleaned face by gently massaging it. Do not rinse. After treatment apply the Soothing Protective Cream. During treatment ensure a good UV skin protection, avoid sun exposure and products with sensitizing potential. 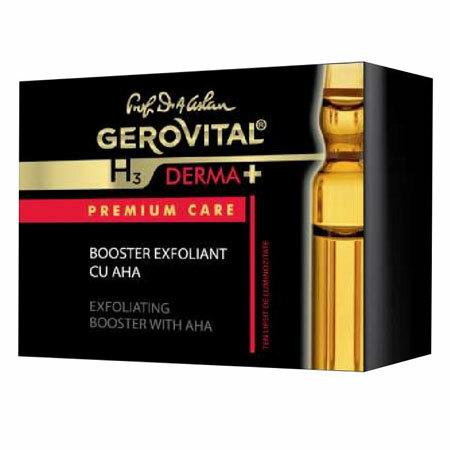 It is recommended to use the Exfoliating booster with AHA in the least sunny seasons. INGREDIENTS: AQUA, GLYCERIN, PEG-6, CAPRYLIC / CAPRIC GLYCERIDES, 3-O-ETHYL ASCORBIC ACID, PENTYLENE GLYCOL, SODIUM LACTATE, PEG-40 HYDROGENATED CASTOR OIL, PHENOXYETHANOL, GLYCOLIC ACID, SODIUM CITRATE, CITRIC ACID, BUTYLENE GLYCOL, SUCROSE, UREA, TRIETHANOLAMINE, TETRASODIUM EDTA, POLYACRYLATE CROSSPOLYMER-6, DECYLENE GLYCOL, CAPRYLYL GLYCOL, MALIC ACID, TARTARIC ACID, DEXTRAN, PALMITOYL TRIPEPTIDE-8, SODIUM HYDROXIDE. Repairs and protects sensitive skin.